As the end of the school year is upon us we’re excited to share our summer StrivU plans! The past two summers we’ve hosted some type of Striv summer educational resource. The first summer we hosted a small “camp” in Henderson and was a lot of fun to have students come in for the day and create a media campaign built around different activities in Henderson. Last summer we decided to switch it up and do something online through G+ Communities. This year we’ve decided to go back to hosting an event here in Henderson at our offices and conduct a day long workshop built around what you are interested in. The format is going to be completely open. Whether you have Wirecast questions, want to come test out & play with our equipment, learn to create a promo graphic or get feedback on your school’s social media strategy we’re opening up our offices for the entire day for you. If you are available to join us on Saturday, August 1 (9am-3pm) please fill out the form below so we can arrange for food and Striv swag to giveaway! 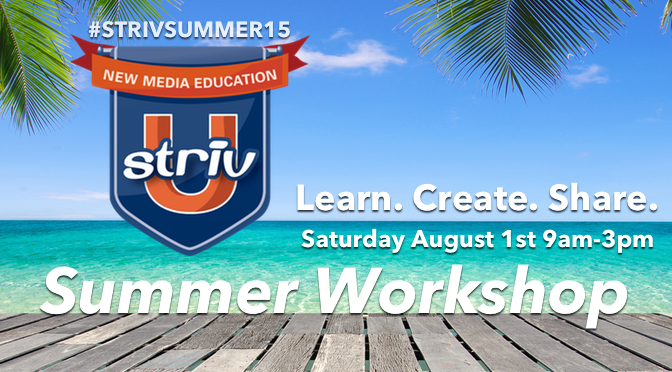 Also, please share this with your class, students, friends and be sure to use the hashtag #strivUsummer15.